An old French expression "to plant mulleins" meant "to work for nothing". The plant has nonetheless been cultivated worldwide for its medicinal properties. Mullein is a triennial herb — the leaves are harvested at the end of the first year or beginning of the second year of growth, and the flowers are collected as they open. Mullein is available in capsule form, in liquid tinctures, as an oil, and in bulk for making tea. Mullein is a terrific narcotic herb that is not addictive or poisonous. Traditionally, it is used as a painkiller and to bring on sleep. Herbalists recommend mullein leaves as one of the safest and most useful herbal lung tonics. The leaves have an expectorant and soothing action on the mucous membranes of the respiratory tract. 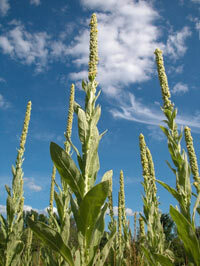 Take mullein for easing the symptoms of asthma, chronic bronchitis, dry coughs, and laryngitis. Mullein is also a useful lymphatic cleanser, and you may find it effective for helping to relieve skin problems like psoriasis. Use the flower oil in your ears for inflammation, earaches, and infections of the Eustachian tubes, inner ear, and ear canal. See your doctor or herbalist if you have an ear infection. Always remember: If you use herbs, do so responsibly. Consult your doctor about your health conditions and use of herbal supplements. Herbs may be harmful if taken for the wrong conditions, used in excessive amounts, combined with prescription drugs or alcohol, or used by persons who don't know what they are doing. Just because an herbal remedy is natural, does not mean it is safe!